Does a book club strike you as too similar to your dreaded high school English class? 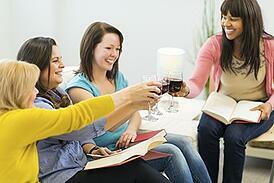 Today's book clubs are lively events that pair insightful literary discussions with fun social interaction. Why not use these tips to start your own book club? You may find yourself coming away with a new book and a new friend! The sky's the limit when it comes to settling on a theme for your club. You can choose a certain genre, such as mysteries or biographies, or enact an anything-goes policy. If you prefer something in the middle, make selections from a source like the New York Times best-sellers or work your way through one of the eclectic lists on List Challenges. It's a good idea to limit membership to 15 people so everyone has a chance to be heard. Choose a time and frequency that makes it easy for the greatest number of members to attend regularly. Once a month gives people enough time to read the next book and weeknights seem to be the preferable time, especially for parents. Many book clubs have their members take turns hosting the meetings. Coffee shops and cafés make nice alternatives for maintenance-free gatherings. If you decide to stick with a particular establishment, you might be able to ask management about offering discounts or special pricing. Determine a method for appointing each session's moderator. It's best to stay away from volunteering, since that could result in a lopsided distribution of opportunities. Will the next book selection be chosen by the moderator or by a vote of all members? Set the tone for discussions. Do you want to go with serious analysis or a more casual format? This may not seem like an important question, but you don't want people dropping out because the group goes in a different direction than what they expected. Have a clear distinction between book time and socializing time. Otherwise everyone may get so caught up in chatting that you run out of time to actually discuss the book! Emails or phone calls back and forth become time-consuming and tedious. Set up a Facebook page or a group on a site like BigTent where news and information can be communicated quickly and easily. We think book clubs are a great way to encourage reading and expand your social circle. Stop by the office at your Springs Apartments community and talk to the leasing agents about reserving our comfortable and convenient clubhouse for one of your meetings!